Leadership is now a team sport. According to Deloitte’s 2017 Global Human Capital Trends Report, more companies are organizing themselves around highly empowered “networks of teams” who can respond quickly and drive innovation. 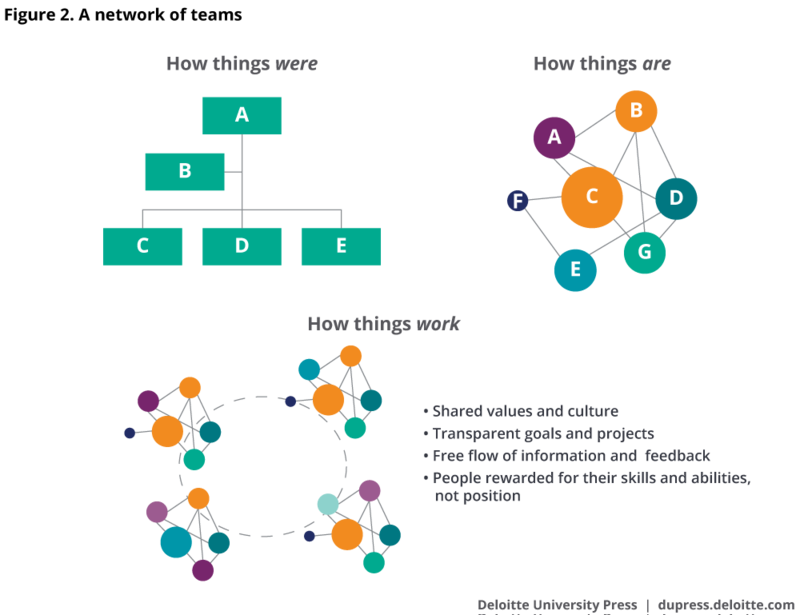 Only 26% of large companies (over 5,000 employees) are functionally organized, and only 14% of executives still believe that hierarchical job levels are effective. Everyone else is embracing the Modern Organization where people aren’t organized by functions, but missions. Companies can define teams by project, product category, market segment or location. But don’t abandon one rigid corporate structure for another – these teams are designed to be flexible, and they’re given the tools and information to quickly complete specific business goals. “For a company to stay agile, teams must be formed and disbanded quickly. High-performing companies today may build a “digital customer experience” group, select individuals for the team, and ask them to design and build a new product or service in a year or two. Afterward, the team disperses as team members move on to new projects. This ability to move between teams without risk is a critical attribute of today’s high-performing companies,” says Deloitte. This also means that the era of the General Manager has ended. As one CEO told Forbes in an article on why teams are now the key to business performance, “If our leaders aren't functional, hands-on leaders, I don't need them around. Information flows easily from team to team and city to city, I don't need managers in the middle to generate reports and tell me when one team is behind or problems are taking place." That’s why even the most experienced business unit heads can struggle when dealing with smaller, agile teams. Everyone’s going through growing pains, and even the smartest executives have to unlearn what used to work for them. Industry experts and CEOs of successful team-centered companies share what helped. According to Forbes, team leaders need to focus on employee engagement because of a millennial workforce that look for values and a sense of personal mission at work. Consider this: Fortune' Best Companies were also part of Glassdoor's Best Places to Work and also LinkedIn's Most In-Demand Employers (Forbes). Their reputation for positive corporate cultures helped them get and keep the best people, and bring out the best in them too. The principle can apply to old employees too. In the same article, fellow leadership and human resources experts recommend similar programs that build a culture of collaboration. Their ideas include job switching (allowing team members to understand each other’s goals, tasks and processes) and cross-training. Both break down the communication gaps that can often occur between people of different backgrounds, disciplines or work styles. BPT (Brainstorm Prioritization Technique) can help you bring out your team’s best ideas to solve problems and get their commitment to follow-through. A Google study found that the single biggest factor in productivity and team success wasn’t the individual players’ skills or experience, but psychological safety. While there are several articles and commentaries on how to build psychological safety, most boil down to the team leader setting an example and establishing processes that remove politicking and favoritism. You need to encourage people to share ideas. You need to protect transparency and accountability for individual actions and allow no room for abuse of authority or the formation of cliques. It was stressful, yes. But Charles realized that he had to be the voice of reason – as a team leader, he had to represent the culture that he wanted to create. To this day, Camille meets with her staff individually: one hour a day, over lunch or a teleconference, to understand what’s going on. Their calls include status updates and anecdotes about family or personal hobbies. She takes notes of birthdays, kids’ birthdays, personal hobbies – everything goes into her notebook, so she remembers random things like buying medicinal tea for an employee who complained about arthritis. With networks of teams, collaboration and clear communication are more important than ever. Team leaders must mobilize teams while maintaining clear and honest communication and encouraging collaboration. Grow provides leaders and their teams the avenue to share insights and ideas while working together in a safe space. It equips them with the leadership skills needed to excellently execute solutions to the challenges of the modern workplace. Give Grow a try today by clicking the link below to sign up for free. Older PostTraining vs. Learning - What Is Your Company Doing?